Buying a new family home can be a long and arduous process—one that demands wells of patience, a steely resilience and an open mind. For Nikki Hunt however, a computer and a webcam were enough. Having trawled through a few estate agency sites, Hunt came across a three-bedroom apartment in London’s South Kensington, asked for a virtual tour of it, and put in an offer the very next day. “When I spotted this one I knew that it was perfect; actually, it was the only apartment we viewed,” she says, with the nonchalance of a seasoned professional. Hunt’s laser-like focus has won her firm Design Intervention countless awards over the years and made it one of the leading studios in Asia. She founded the company in 2010 with partner Andrea Savage and almost 10 years later, the duo regularly scoop up some of the world’s most prestigious design prizes; and last December, the practice received the World’s Best Designed Kitchen and Best Designed Bathroom accolades at the International Property Awards. 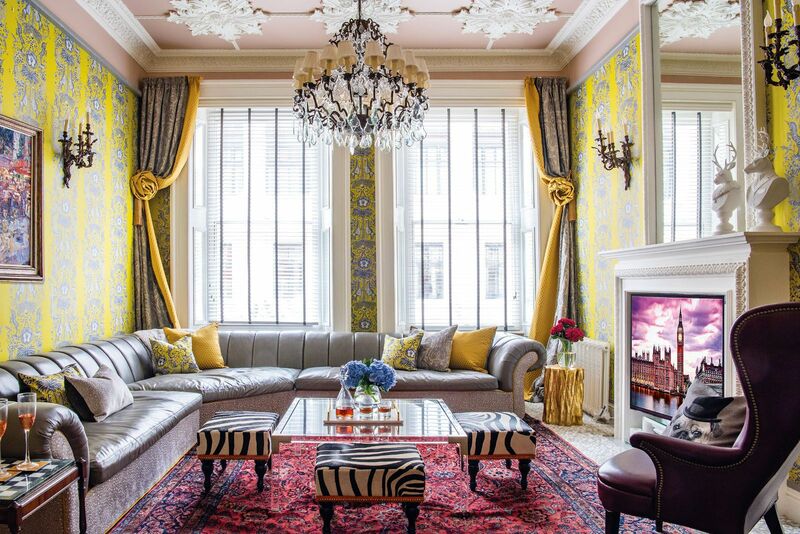 At the recent Tatler Design Awards, the firm scooped up the Best Bespoke Project accolade for a floral-themed apartment. Their signature style is bold yet they ensure that each of their projects remains sympathetic to its surroundings. In the case of Hunt’s apartment, it was the building and its heritage that provided inspiration. Granted, Hunt’s vast experience in the home industry stood her in good stead and her ability to hone in on the tiniest of details was a plus—it was a precise list of exactly all the things that she was looking for in her new home that made the process so swift and painless. “One of my favourite things about London is the architecture of the Victorian-era buildings, so I looked for an apartment with a sense of history,” she shares. Beyond that, practical considerations reigned. Hunt wanted an apartment close to South Kensington and Knightsbridge for the ease of access to the airport, while being within walking distance to Hyde Park and Harrods food hall. It also had to be large enough for her family of four and feature a live-in concierge who would watch over the home in their absence. Built in the 1850s, the apartment is redolent with Victorian features and Hunt was keen to preserve and enhance them through her design scheme. “I do like a home to have a sense of place—I really wanted this to feel like England,” she says. In the living room she recreated a Rococo rose motif across the ceiling to recall the plasterwork of the era, opting for a blush pink finish to add a contemporary edge. The bold yellow wallpaper meanwhile, was inspired by a popular damask design that also creates the effect of Hunt’s favorite room by designer John Fowley, a master of the British country house and whose ability to make even the most formal of rooms feel inviting has been a huge influence on her work. Naturally, the bold colour also helps to brighten even the grimmest of London days. “I have consciously picked an uplifting colour palette so that this home resonates with a cosy cheerfulness even on the darkest of winter days,” she says. “I love the eccentricity of the English and I wanted this home to reflect this through whimsical elements and classic English motifs.” Art Deco touches can be found in every room, from the Sputnik chandelier hanging above the master bedroom to the door handle details on the bedroom closets. The furniture and furnishings were all made in Asia, partly because of costs but primarily because it allowed Hunt complete control over the overall ambience of her new home. “I wanted a completely cohesive home and designing everything in-house allowed us to create a seamless flow as well as control the quality of what went in,” she says. With her pied-à-terre fully furnished, Hunt finds herself increasingly London-bound, especially since her children have begun their studies in the British capital. She has become so adept with the 16-hour journey that she has fine-tuned it to the hour, leaving the apartment at precisely 7.30am to make the 9.10am flight back to Singapore.